Veteran Class War anarchist Ian Bone doorstepped the Honourable Member for times long past Jacob Rees Mogg this week. As the BBC has reported, “A video on the Facebook page of the Class War group shows a man telling one of the Tory MP's children ‘your daddy is a horrible person’ … The Archbishop of Canterbury, Downing Street and many MPs have strongly criticised the stunt”. 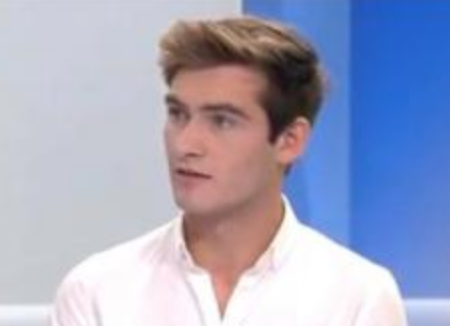 Indignation? There’s an app for that. So it was that the perpetually thirsty Paul Staines and his rabble at the Guido Fawkes blog latched on to the incident, in the fervent but vain hope of linking Bone to Labour leader Jeremy Corbyn. This duty was delegated to Fawkes new boy Tom Harwood, who has shown himself a more than capable replacement for his predecessor Alex “Billy Liar” Wickham. Because Harwood can lie just as shamelessly. “The principal harasser of Jacob Rees-Mogg’s family and children outside his home yesterday was Ian Bone of an organisation called Class War. 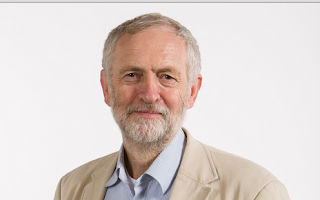 He has considerable links to Corbyn’s Labour Party” he told readers yesterday, before claiming “Shadow Cabinet ministers John McDonnell and Richard Burgon joined with Class War on a protest just last week in SW1”. No. Just no. Bone tagged along on someone else’s protest. But do go on. “Bone boasted that Corbyn’s new chief adviser, Andrew Fisher, is a Class War supporter, who lives just around the corner from Bone himself”. No he isn’t, and “living just round the corner” is stretching guilt by association beyond the limits of elasticity. 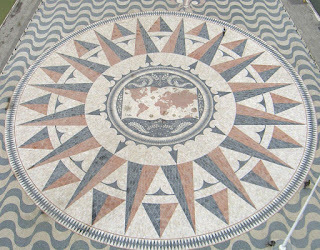 Have another go. “the Guardian published a cosy article in 2006 profiling Ian Bone and publicising his new book entitled ‘Bash the Rich’”. So f***ing what? Room for a last desperate one? Sure is: “here he socialising with the Labour Party leader’s brother Piers Corbyn”. Yes, it’s that lame. We can find out exactly what Ian Bone thinks of the Labour leader. And Owen Jones. And Gordon Brown. And when Harwood says of Bone “he's bezzie mates with Corbyn's chief advisor, hangs around with Corbyn's brother, and marches with John Mcdonnell and Richard Burgon”, he’s lying again. 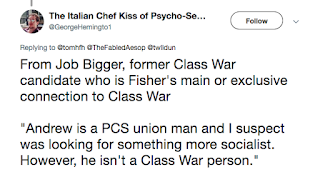 As someone who understands where Ian Bone is at has said, firstly on the claim about Corbyn advisor Andrew Fisher, “From Job Bigger, former Class War candidate who is Fisher's main or exclusive connection to Class War … ‘Andrew is a PCS union man and I suspect was looking for something more socialist. 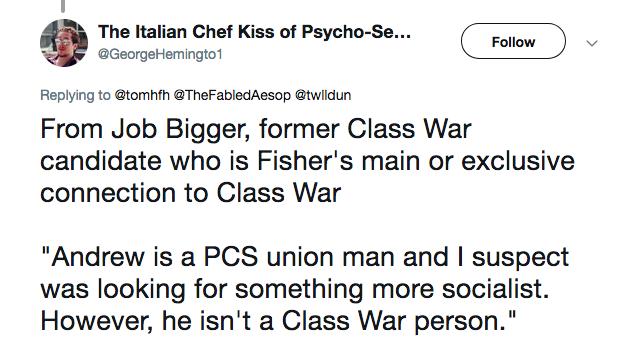 However, he isn't a Class War person’”. 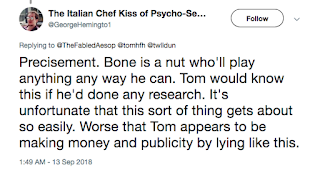 And secondly, confirming that Bone tagged along on a march featuring McDonnell and Burgon, rather than the other way around as claimed by Harwood, “Bone is a nut who'll play anything any way he can. 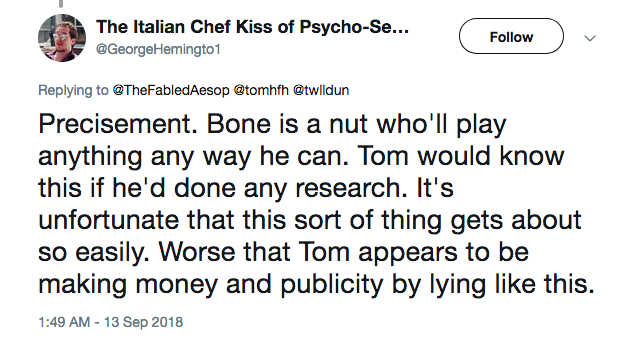 Tom would know this if he'd done any research. It's unfortunate that this sort of thing gets about so easily. Worse that Tom appears to be making money and publicity by lying like this”. Welcome to the new Fawkes teaboy. 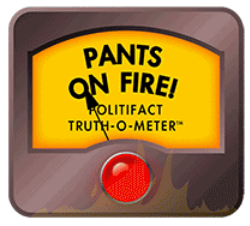 Who is a congenital liar, just like the old Fawkes teaboy. Another fine mess, once again. FAR RIGHT WEBSITE IN TRYING TO SPREAD LIES SHOCKER! Ian Bone publicized his Rees-Mogg & nanny stunt well in advance, on his Twitter feed and elsewhere. There was a police presence. "NANNYGATE! 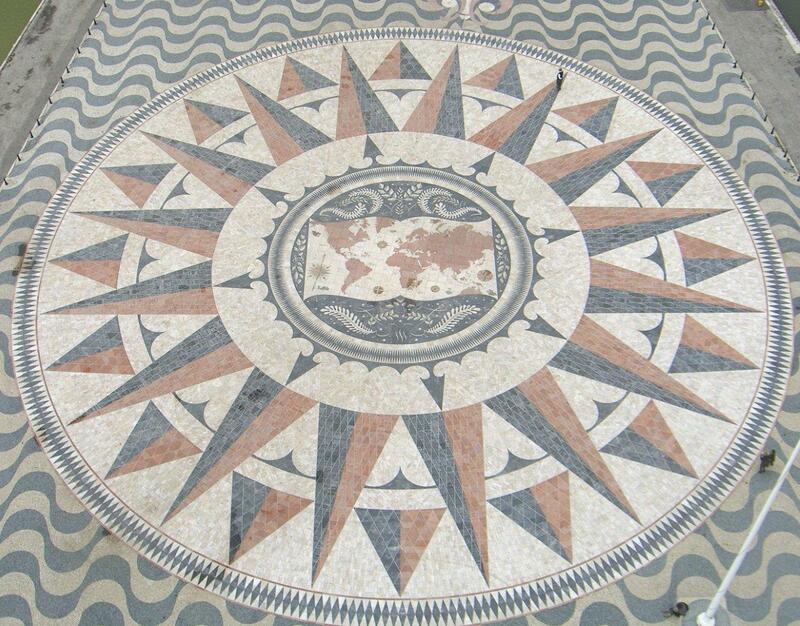 one performance ONLY CHEZ MOGG MANSION.TUESDAY 11th 6pm COWLEY STREET" he told the world. So it's highly unlikely the Mogg family didn't know about it. Rees-Mogg himself seemed to be quite enjoying it all, smirking for the cameras and engaging with Bone. His kids were presumably on hand to enjoy watching daddy deal with those dastardly anarchists. So why is it a shock to some that anarchists don't behave as politely as the local vicar when demonstrating against the privileged? And why were nanny and her employers not keeping the kids indoors? Can't be for the publicity value could it? As for the Guido rabble, how did they get the video? Was Tom there? So... if he was can we say he supports Class War?